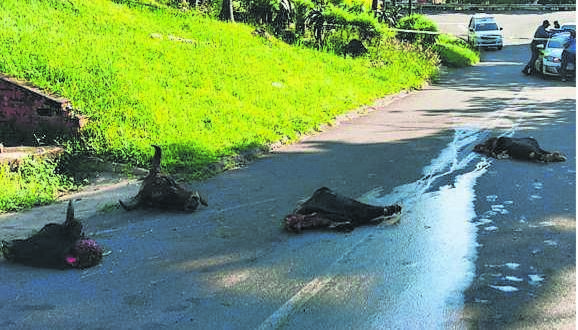 Cattle carcasses were scattered across a road in Durban on Thursday following a high-speed chase between police and stock theft suspects. A high-speed chase and shoot-out between stock thieves and police which started at Cato Ridge, ended when the suspects crashed their vehicle, scattering cattle carcasses across the road. The six men were driving a stolen white Ford Ranger and crashed the vehicle in the Berea area in Durban early on Thursday morning. The Pietermaritzburg K9 Unit and Pietermaritzburg Stock Theft Unit received information about the vehicle and spotted it on the N3 heading for Durban. They gave chase, with Magma Security assisting, as the six men sped down the N3, and took the M13 exit heading toward the Westville area. A source who asked not to be named said the suspects began shooting at their pursuers. “They pulled back from the vehicle and phoned Westville police to set up a road block to catch them [but] the men started shooting at the officers and got through the blockade,” said the source. The Pietermaritzburg K9 Unit, Stock Theft Unit and Magma Security chased the vehicle to the Berea area where the suspects crashed the vehicle. Provincial police spokesperson Captain Nqobile Gwala said “Cattle carcases were scattered across the road”. She said the men abandoned the car and ran away. The Pietermaritzburg K9 Unit tracked down and arrested three men between the ages of 29 and 41. Gwala said the cattle are suspected to have been stolen in the Umzimkhulu area. He said more arrests were expected. The men are expected to appear in court on Friday.